Citing a toxic environment and gross violations of workers’ lawful organizing rights, the International Association of Machinists and Aerospace Workers (IAM) on April 17 withdrew its petition with the NLRB for an April 22 union election at the Boeing Company in North Charleston, SC. The decision pushes the date for a subsequent election forward by at least six months and was made after IAM organizers conducted home visits with more than 1,700 Boeing workers. The petition for a union election was filed on March 16, 2015 after a significant number of Boeing workers signed authorization cards expressing interest in union representation. Workers at Boeing had reached out to the IAM regarding numerous workplace concerns, including forced overtime, rising health care costs and a lack of respect on the shop floor. In addition to filing Unfair Labor Practice (ULP) charges, the IAM recently suspended home visits after two organizers were threatened at gunpoint and others reported hostile and near-violent confrontations. The IAM will continue to work with Boeing workers and members of the Charleston community to further communicate the benefits of collective bargaining for workers and their local economies. Efforts will also be made to dispel the misinformation spread by Boeing and their allies over recent weeks. Copyright Photo: Arisara Petersen/AirlinersGallery.com. 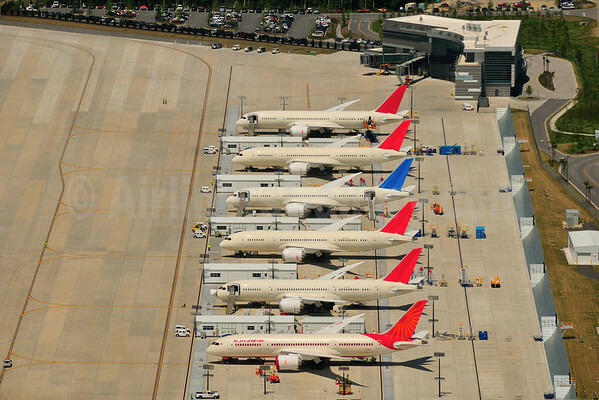 The Boeing 787 Flight Line at North Charleston, South Carolina (CHS). This entry was posted in Boeing, IAM and tagged Boeing, Boeing 787, Boeing 787-8, Boeing 787-8 Dreamliner, Boeing Charleston, Boeing South Carolina, IAM, the Boeing Company, the International Association of Machinists & Aerospace Workers (IAM) on April 18, 2015 by Bruce Drum. Members of the International Association of Machinists and Aerospace Workers (IAM) District 751, District W-24 and District 70 will vote January 3, 2014 on a revised proposal from the Boeing Company that would secure 777X production in the Puget Sound area. Details of the revised offer will be provided by mail to IAM members and their families prior to the January 3 vote. The new proposal contains significant improvements over an earlier offer from Boeing that was rejected by IAM members on November 13, 2013. The January 3 vote will take place at IAM Local union halls in Seattle, WA, Portland, OR and Wichita, KS, with results announced later that day. This entry was posted in Boeing, IAM and tagged 777X, Boeing, Boeing 777X, IAM, international association of machinists and aerospace workers, The International Association of Machinists and Aerospace Workers on December 23, 2013 by Bruce Drum.